If you want to improve the energy efficiency of your home all year round, whilst keeping out noise at the same time, then installing double glazing is a great option. Whether you want to install new windows or update existing units, Kingfisher offer double glazing as standard for all of their window installations. All of our double glazing is A rated for energy efficiency as it uses Europe’s best thermally performing glass – Planitherm. Double glazing that is rated well for energy efficiency means more heat is retained in your home, helping to keep you warm when you really need it. Planitherm products are soft coated and reflect heat back into a room – the outer pane can even capture the heat from the sun. This in turn eliminates cold areas around windows, making your living spaces more enjoyable all year round. Our double glazing can incorporate our decorative glass and many options of window frame – helping you to create truly bespoke home improvements without compromising on thermal performance, acoustic insulation or even security. Double glazing is widely accepted as an energy efficient, thermally insulating and all round better performing choice of glazing for windows. 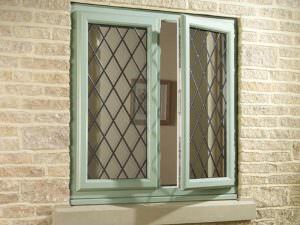 Fortunately, Kingfisher windows has gone one step further and now offers an even better solution – triple glazing. The easiest way to describe triple glazing is that it has 3 panels of glass. It uses the same key design as double glazing – it is made using two think panes of 4mm glass which are separated by an insulation space and a central reinforced pane. The extra layer of reinforced glass slows the escape of heat from your home, deters thieves and makes your living spaces more comfortable. What’s so good about triple glazing from Kingfisher? Here at Kingfisher, we only want to pass on the best quality glazing to people like you. That’s why we can manufacture our windows using Planitherm Total + triple glazing. A part of Europe’s best-selling range of high performance low-emissivity glass (low-E glass), Planitherm products use the very latest advancements in thermally insulating glass coating technology. Combined with Kingfisher’s quality frames, manufacture and installation, it is easy to achieve a high level of solar heat gain, capture warmth from natural daylight and draw it into your home. Together with a warm-edge spacer bar and insulating frames, this creates a window that will achieve the maximum Windows Energy Rating of A+. Even if you have insulated the rest of your house well, inefficient glazing can create cold spots that surround the windows at night. These cause draughts, draw heat away from you if you sit next to them, and result in streams of condensation running down the panes. Triple glazing shouldn’t be underestimated – it will make the insulation of your house consistent throughout. Equally, bearing in mind that double glazing can save you up to £80 on heating bills, you can imagine how much of a difference that an extra glazing layer can make. This is hugely beneficial, especially in the Winter months when heating costs rise. 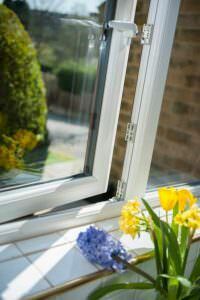 Whether you in the centre of Leeds city, next to a noisy farm or right on a main road, triple glazing can significantly reduce noise and enhance security. Combined with Planitherm glass (which lets more natural light in and less heat out), our triple glazing really helps you to make the most of your living spaces. Since 1989 we have been pleasing customers across Yorkshire with our home improvement services. We manufacture all of our windows to exceed current quality and energy efficiency standards by using the best components and latest technology. As well as top level manufacturing, we ensure that your new windows are installed with precision and care in your home, by reliable tradesmen from our family-run business. Feel safe in your own home with enhanced security windows, so secure they’re endorsed by the police. Ensuring your windows are manufactured to deter thieves and burglars is our utmost priority. Which is why all of our windows are manufactured with the latest high security features and are rigorously tested to exceed current industry standards for security. Our windows achieve PAS 024:2012 for Enhanced Security Performance, meaning both the window and the lock should resist any opportunistic attack. 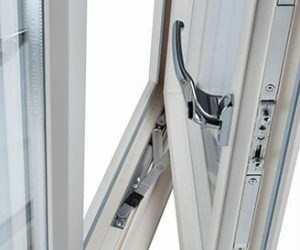 These windoows also achieve Secured by Design accreditation, for windows that meet the high security standards of the police. Secured by Design (SBD) windows and doors are the highest security products you can install to protect your home. Secured by Design is endorsed by the Association of Chief Police Officers. We are one of only 450 companies who are entitled to use the Secured by Design logo and promote the term ‘Police Preferred Specification’ on products which have passed the tests specified by ACPO Secured by Design. It is highly recommended that all habitable rooms above ground floor have windows with fire escape hinges. If you do not currently have them, then they are not necessarily required when you change your windows, but it is highly recommended that you do. Fire egress windows allow for windows to be opened up to 90° in case of an emergency, ensuring you and your family can exit safely in the event of a fire. All our fire escape hinges are also available as easy clean hinges. All properties lose heat through their windows, but by installing energy efficient double glazing in your property, you can keep your home warmer and quieter, as well as significantly reducing your energy bills. Whether you choose uPVC or aluminium windows, all our double glazing encompasses the very latest thermal technology, achieving an ‘A’ Windows Energy Rating. Replacing all single glazed windows in a typical semi-detached house with our A-rated frames will give you a saving of up to £4000 over 10 years on fuel bills. To help us achieve A-rated windows, Kingfisher uses Planitherm Glass, a brand of low-E glass that is designed to stop heat escaping by reflecting it back into a room, whilst capturing warmth from natural sunlight, keeping your home warmer naturally. Kingfisher double glazed windows also feature an Edgetech warm edge spacer bar, which separate the panes of glass in a double glazed unit. These conduct less heat or cold than traditional aluminium spacer bars, for the ultimate insulated windows. Whether you’re looking to replace your existing period windows like-for-like, or you want to add a unique touch to your home, you’ll find the ideal bespoke glass or glazing in our collection. We offer an extensive range of glass, including the latest patterned designs, leaded and Georgian bar effect windows, and even bespoke stained glass. As well as unique designs, you can benefit from practical glazing such as toughened, acoustic, self-cleaning and solar glass. All our windows are ‘A’ rated for energy efficiency as standard, with sealed glass units that are argon-filled and use a warm-edge spacer bar. Leaded windows remain a popular choice among our customers looking for modern uPVC double glazing with a traditional twist. Rather than Georgian bars that are ‘stuck on’ the outside, window ‘leading’ is usually applied to both sides of the external pane of glass, to give the look of a traditional leaded windows. As well as the classic square and diamond patterns, you can also choose a bespoke or more embellished design. Decorative glass designs can also be encapsulated within a triple glazed unit to offer easier cleaning and maintenance. … or any design you require! With such a large range of leaded and decorative glass windows on offer, you’re sure to find the ideal glazing for your new windows. Not only that, but we manufacture our windows using the highest quality materials, for ‘A’ rated double glazing and up to ‘A+’ energy rated triple glazing. Design and create your own stained glass designs, copy an original window or choose from our coloured glass designs. At Kingfisher, We don’t just offer windows with colourful frames. You can also add a splash of colour to your home with new stained glass windows, available in a range of patterns, or design your own bespoke window from scratch. Double glazed windows from Kingfisher can achieve up to an A Windows Energy Rating, with an A+ rating for triple glazing, and we can work with you to ensure that your stained glass windows keep out the worst of the wet and rainy Yorkshire weather! A stained glass window is typically a full-colour window, made from different pieces of coloured glass fitted together with leading. 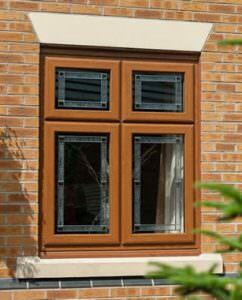 A feature window is very popular, as are internal stained glass windows and top or side panels for doors. Floral, geometric and Art Deco styles are common requests, as are Leeds United and Bradford City designs! New windows with new stained glass. Create a new stained glass window from scratch. Either design your own window, or speak to one of our window designers for inspiration. Upgrade & encapsulate your existing stained glass units. Stained glass doesn’t always fit exactly into new window frames, but we are able to sympathetically increase or decrease the size of the existing glass panes to ensure they fit correctly. Copy a stained glass window design. Seen a stained glass window you love? Simply send us a copy of the design and we’ll price you up a new window. All new and replacement stained glass can be encapsulated in double or triple glazed sealed units, and set in uPVC or aluminium window frames.